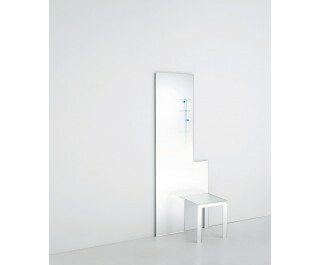 Collection of mirrors with a metaphysical appearance and an integrated seat. Available in the mirror-chair version and in the mirror-stool version, the mirrors are totally made of 10 mm thick tempered and silver-plated extralight glass. Thanks to an acid-etching treatment, the finish of the seat and the lower part of the back becomes metallic and iridescent. This effect vanishes going up and gradually fades becoming a true reflecting mirror. The seat is joined to the back by means of a mechanical fixing.